Unlike Adobe's other web-oriented products in CS4, Flash brings major changes, from the way the entire interface is presented through to the way in which certain animations are created. Whereas previous Flash upgrades aimed to snare programmers and developers, this update's one for the animators. Right away, longtime users will note how the stage and timeline have switched positions. Rather than mess about with keyframes and timelines (although you can still do so using older methods), Flash promotes intuitive object-based animation: [Ctrl]-click on an item, select Create Motion Tween and drag a path for your object. The path remains fully editable via Illustrator-like Bézier curves. Elsewhere, inverse kinematics can be applied to objects, enabling animators to create rag-doll-like figures or chain-like animations in relatively little time. And while the new 3D transformation tools aren't the stuff of wonder, they provide a means of animating 2D objects through 3D space with little effort. 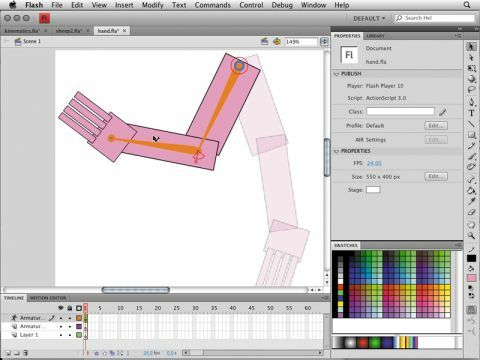 Those hankering for more control can explore the impressive new Motion Editor. This panel smacks of After Effects and displays a tween's (or span's) attributes, thereby providing a huge degree of control for fine-tuning motion, rotation, transformation, effects and filters. A handful of additional features such as an Illustrator-like spray brush and H.264 support add to the goodies pile. Only the high price, slight sluggishness and buggyness, and nasty proprietary interface elements taint an otherwise impressive Flash update.